Discount Pricing for May 2019! Enjoy Low Season per night prices at Casa Suenos for May 2019! 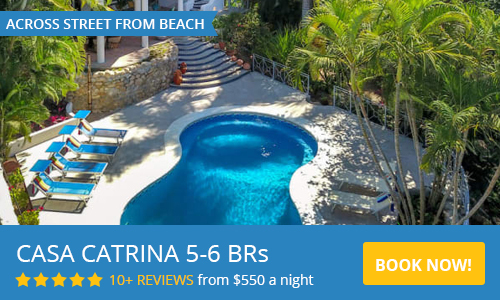 Casa Sueños in Sayulita is a family friendly, five bedroom four bath Villa, with a pool you have to see to believe, in one of the best kept secret tropical regions in the world. The laid back blissful quality of life in Sayulita can not be easily defined. Palm trees, lazy sunsets, surfers, live music, affordable local fare and the best shopping in Mexico await you in Sayulita. Casa Sueños can accommodate 10 guests. Casa Sueños is nestled on a secluded hillside overlooking the Pacific Ocean, with fabulous sunsets you can see from the 3 terraces! You are surrounded by lush jungle vegetation that fringe the pool, and envelope your senses. Listen to birdlife and the night time jungle sounds which will lull you to sleep. 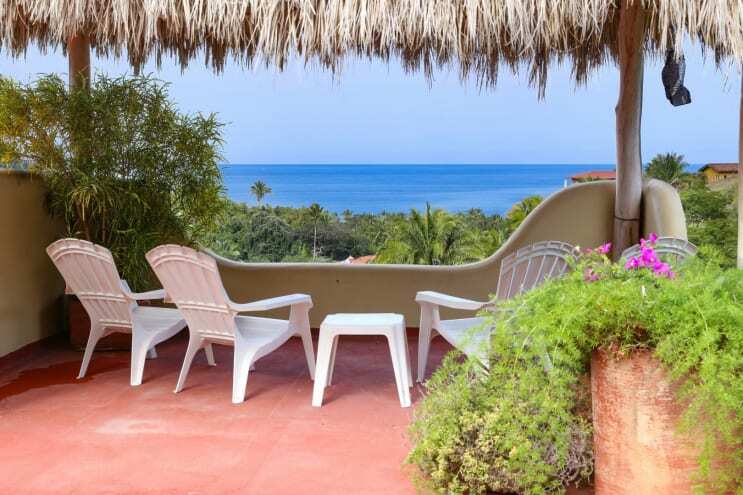 10 minute walk to the North beach and approximately 5 minutes more to the town plaza in the fun surf-town of Sayulita. This luxurious house accommodates ten guests in 5 bedrooms, 4 baths, living room with flat screen TV, Wi-Fi, DVD and CD players, each having a small library. Well appointed large kitchen area with modern appliances, Dining space, overstuffed furniture, 3 open terraces, and a pristine 63 foot long swimming pool with kiddie splash area! An outside open-air shower is located next to the pool for easy rinsing off. The 5 bedrooms consist of 1 Master suite with a small terrace, 2 separate queen bedrooms, and 1 bedroom with 7ft.bunk beds. The additional 5th bedroom and 4th bath guest casita, sits adjacent to the main house, and is equipped with AC! Bedrooms are equipped with ceiling fans. The Master Bedroom, one upstairs bedroom, and the downstairs bedroom have A/C. All baths are full, with walk-in showers! There is an open air terrace on the second story overlooking the pool along with views of the Pacific Ocean and surrounding jungle. The palapa covered roof terrace offers a quiet space with breathtaking views. Plenty of private seating areas both inside and outside the villa. Please use the contact form for any questions and to request a reservation. We look forward to welcoming you as our guest at Casa Sueños in beautiful Sayulita! The pool was wonderful and well kept. Great to have the pool house along with the house for space. The upstairs master bath has poor water pressure and the beds are very firm. Otherwise generally comfortable. This Casa has everything you need for a chill vacation away from the hustle and busyness of life in California. Its walking distance to the beach and shopping and to the most amazing food and all very affordable. There were 7 of us and we had more than plenty of room to eat, play, sleep and rest and float in the pool. I would highly recommend this Casa for your stay in Sayulita! Special note about the owners Steve and Becky, Heather and Arturo they were super responsive and so very helpful with suggestions, hints, bookings for excursions and tips of where to eat and play. Thank you for your kind words. We were so grateful to have you and Judy and the rest of your guests...come back anytime and we would love to offer you a discount on your next stay! Thank you so much for your kind words! We are very grateful to have folks like you and your family enjoying our home. Please come back and we will offer you a discount on your next stay! We recently returned from an 8 day vacation in Sayulita (Jan 9 – Jan 17, 2018), where we stayed at Casa Suenos. The home was amazing, with awesome views from 3 levels and had plenty of room for the 7 of us to sleep and spread out, but also had comfortable areas where we could spend time together. We enjoyed the refreshing pool after spending time at the beach, and we appreciated the quiet after spending evenings in town where the activity never stops! The beds were comfortable, and we found everything that we needed in the kitchen for the few times that we cooked, and the many times that we blended tropical drinks. We just found the food & prices in town too good, to do much of the cooking ourselves. It was an easy walk into town, but we did enjoy the couple of days that we rented a golf cart to get us back and forth a bit quicker and also allowed us to explore a little further. Heather, the property manager was great, and provided some excellent dining choices, as well as some info about jungle hikes and secluded beaches. We had an awesome time, and hope that we have an opportunity to visit again! The property was perfect for our needs! Very big and lots of space. Exactly as the picture and description says. Communication was constant, smooth and easy. Thanks for a great stay! Casa Suenos is an amazing house! The pool is enormous and the kids were in it all day every day. It's family friendly, with lots of decks for the adults to sit and enjoy the views. There is a BBQ for delicious meals, great wifi if you need it, fun music, beautiful open spaces and a rooftop palapa for hours of talking. The hosts were gracious and helpful, super communicative. This is truly a special place in a special village in Mexico. I'd recommend this property to anyone and we very much hope to stay here again. Casa Suenos was the perfect house for our group of nine. Beautiful ocean views and awesome jungle sounds at night. The property manager, Heather, was very helpful answering all our questions and arranged for our transportation from and back to the airport. Sayulita is a beautiful community, clean with great restaurants and shopping. Casa Suenos is a rental that had all that we could ask for: amazing views, beautiful interior, nice layout, and a very nice pool. The casita was adorable and nice to stay in. It is just far enough away to be a nice getaway from the beach and plaza, but not so far that it's a pain to get around. That being said, I would still recommend renting golf carts or a bicycle to get around the town. The owners and the caretaker of the house were also a pleasure to deal with, very communicative and timely. I have no complaints at all. I would definitely book here again in the future, and hope to do so! What can I say, our stay at Casa Suenos was amazing. Relaxing in the pool, listening to music with a cool drink or reading a book under the shade of a palm tree on the lawn in the afternoon; Casa Suenos has many choices for family entertainment. Enjoyed cooking in the well equipped kitchen and BBQing our meals by the pool. Walk to town is easy and you get a feel of the culture as your deciding where to eat or shop. Highly recommend to my friends and family. Hi, we are Steve and Becky. We currently live in Northern California. On our first visit to Sayulita we fell in love with this amazingly lively seaside village. It's authentic cobblestone streets, great restaurants, and tons of great shopping.